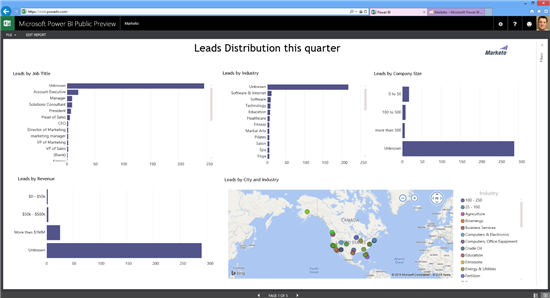 With Power BI our customers can keep a pulse on their business by bringing all their data together and monitoring it through a single pane of glass. Live Power BI dashboards and reports show visualizations and KPIs from data that reside both on-premises and in the cloud, providing a consolidated view across the business regardless of where the data lives. With Power BI content packs for popular services such as Marketo and others, you can now connect and view your data in Power BI with pre-built dashboards and reports, in a matter of minutes. 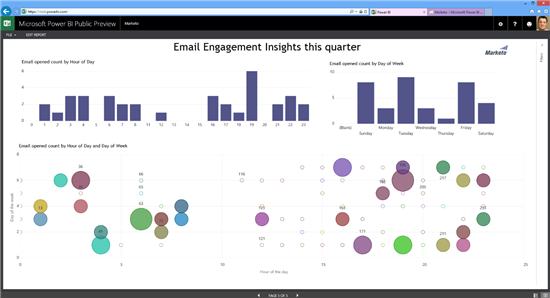 The Marketo content pack for Power BI gives you insights from the valuable data building up in your Marketo account. 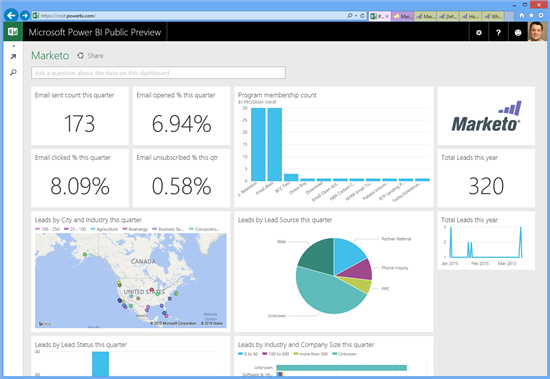 In Power BI, you can create a dashboard that includes data from all the services you use to get your job done. 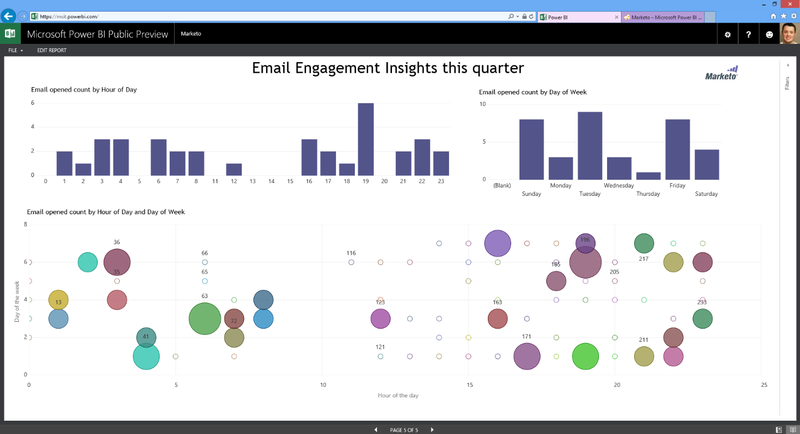 Then you can easily share the dashboard and the insights it contains with everyone on your team. 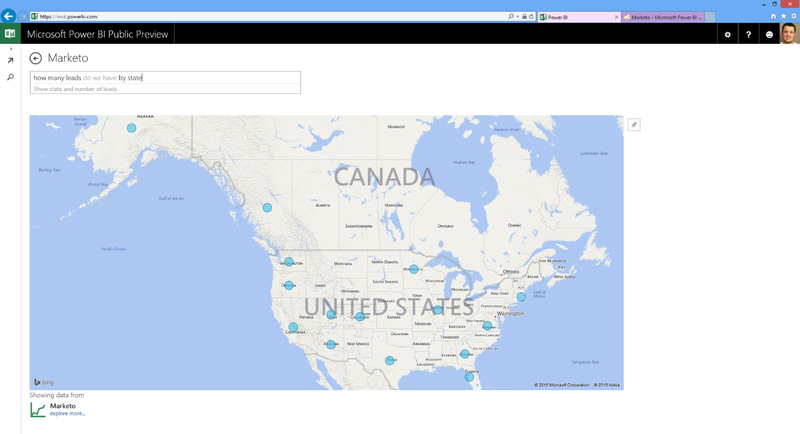 In this blog we wanted to show you the insights you can get by connecting your Marketo account to Power BI. We have a Marketo account that contains details of multiple email campaigns and the leads they generated. After logging into Power BI, we were able to create the following dashboard with just a few clicks. It includes details like the number of emails sent this quarter, the percentage of emails that were opened, a map showing where your message is resonating, and the sources yielding the most leads. We can ask questions of the data using business terms using Power BI’s Q/A technology – its natural language search right on top of the data in my Marketo account. Below you can see we typed “how many leads do we have by state” and that immediately provided the answer. The dashboard also comes with a detail report. By clicking any of the charts in the dashboard, we can drill through to a detail report. The default report has useful insights you can use to analyze your lead generation. Below we walk you through the default report. Before we do, it’s important to know that you can customize the report and dashboard to meet your unique needs. We don’t go into that here, but we’d recommend giving it a try yourself (see how). 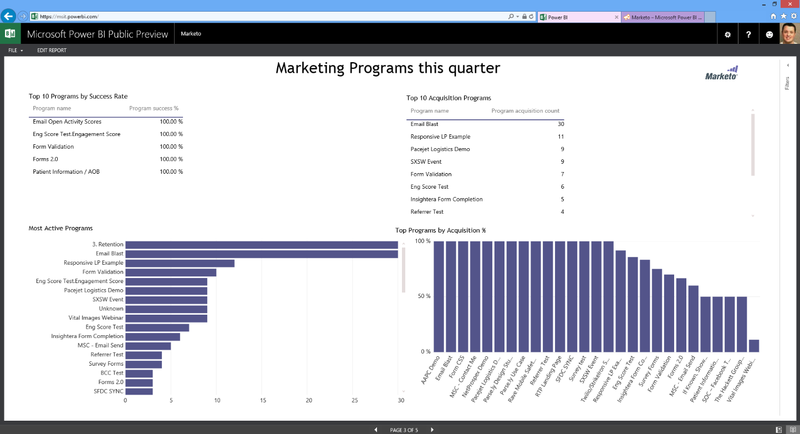 This is especially useful since everyone’s usage and needs depend on their goals, so customizability is a key benefit of using the Marketo integration content pack for Power BI. When you consider that you can mashup data on a single dashboard from multiple other sources like Google Analytics (coming soon! ), it makes it all the more useful. The report has a lot of good insights. This page shows you if your emails are targeting the right people by job title, industry, company size, geography, and see how much potential revenue could come from the leads you have. There’s a page that drills into lead acquisition giving insights on which lead sources are performing the best, the breakdown of leads by lead status and allows you to slice the metrics by industry, company size, revenue and country. It’s a good reference if you’re actively doing customer development. 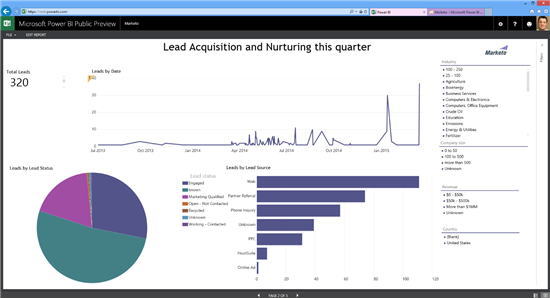 The connector also has a page focused on how your marketing programs are doing. Especially useful is the top programs by acquisition percentage which helps you compare the programs against each other to ensure you’re focusing on programs that work. You can also see the top 10 programs by success rate, top 10 acquisition programs and the most active programs. The email engagement page lets you see which emails are effective and which could be improved. You see the number of emails sent, open rate, link click rate, unsubscribe rate, and delivery rate for the emails you send. You also get breakdowns by device and user. 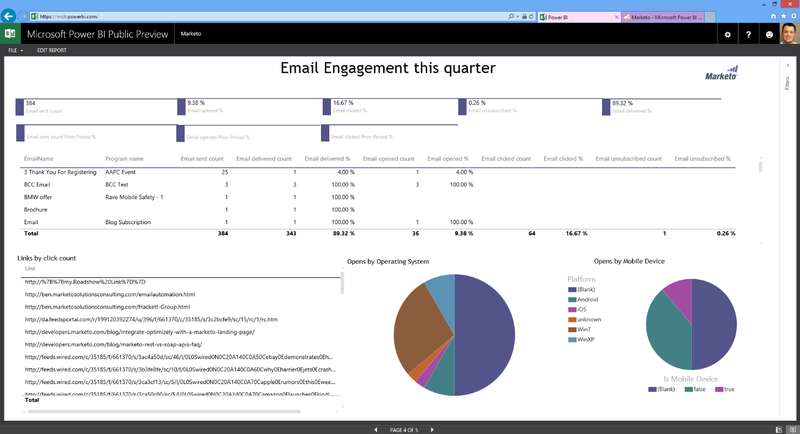 The last page helps you understand when users are engaging with the emails you send. You might use this to adjust the time your mails are sent or to ensure there are enough customer support staff to handle high traffic periods with speedy answers giving you an advantage over your competitors and building positive sentiment. If you run into issues or need help getting going, please do not hesitate to reach out to us. You can contact support either by clicking the “?” when you’re signed in to your Power BI account or from the “Contact Support” link on our support site.